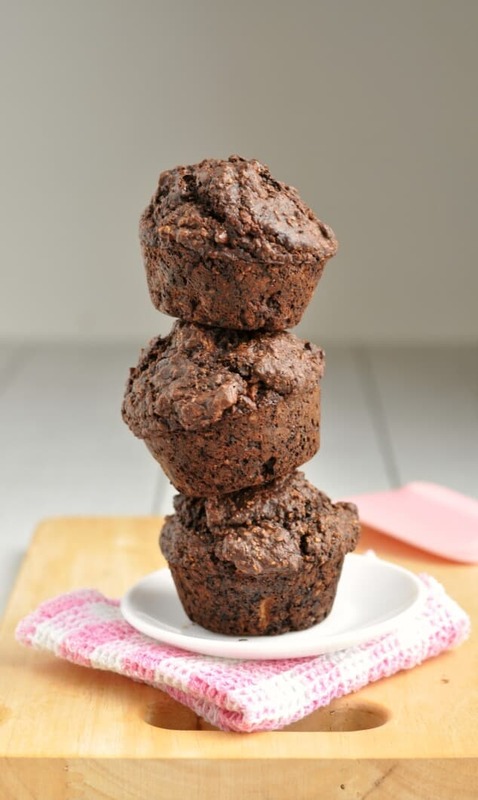 You are here: Home / Breakfast / Healthy Double Chocolate Bran Muffins – XXL Bakery Style! When I posted a recipe for Healthy Chocolate Chip Bran Muffins a little while ago, I honestly never imagined it would be a hit with you guys. I thought you’d take one look at the word “bran” and run far, far away screaming…straight into the nearest bakery to console yourself with a chocolate-glazed doughnut. Before I tried my own bran muffins, that’s totally what I would have done. But maybe you’re more opened-minded than I am. Or maybe you have more faith in me than I do. Because whatever you reasons were, you stuck around and told me about how much you loved those healthy bran muffins! So, not wanting to let the bandwagon race past me and all that, I decided to jump on it and whip up an even better version – this time with twice as much chocolate! When I make sweet treats, I usually keep the portion size pretty small. You know what they say – everything’s fine in moderation, right? 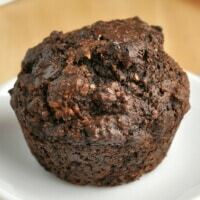 But when I made these healthy double chocolate bran muffins, instead of putting a modest amount of batter into each muffin mold, I rammed as much in there as I could! The result was the most amazing, the most incredible, and the most fantastic XXL muffins. Like the kind you get in a bakery! Because they’re such a generous size, these healthy muffins are perfect for a genuinely healthy breakfast that will get you through until lunch. Add a spread of healthy fat – like homemade peanut butter – and you’ve got a pretty balanced breakfast you won’t be able to get enough of. I reckon you could totally use the batter to make 12 smaller snack-size muffins, but I haven’t tried it out for myself. So I can’t be too accurate when it comes to the timings. I suggest keeping the oven temperature the same but only baking the muffins for 8 minutes if you’re going to make half-size ones. Do the usual trick – stick a toothpick into the centre to tell if they’re cooked. If it comes out clean or with just a couple of crumbs, you’re good to go. Get those babies out of the oven! But if it comes out wet and covered in batter, close the oven door and give them another 3 minutes. Trial and error. Trial and error. 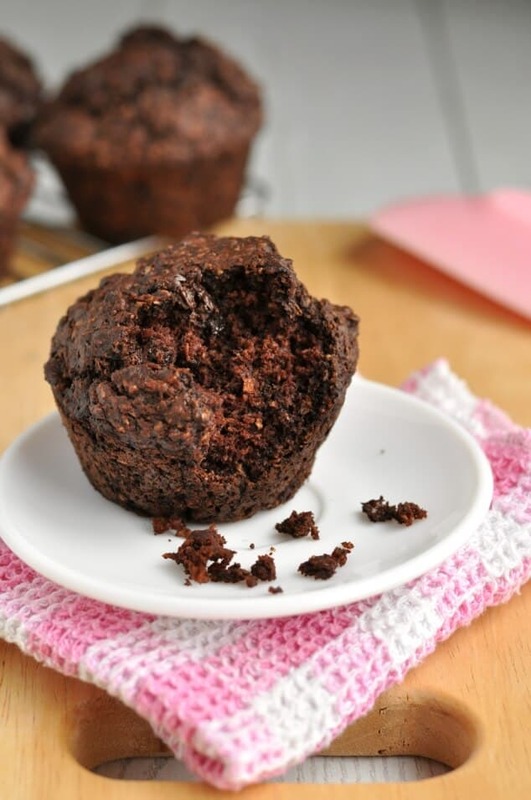 There are a couple of things I need to tell you about these healthy double chocolate bran muffins before you rush into your kitchen to make them. First – don’t use cupcake wrappers. 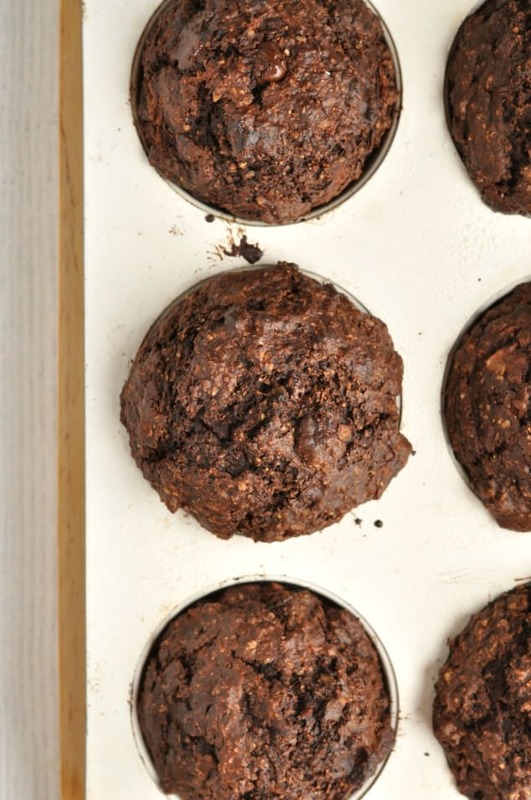 These healthy muffins are made with hardly any fat. So if you use cupcake liners, they’ll stick to them and there’ll be more muffin on your paper than in your tummy. And nobody wants that. I use a non-stick virgin coconut oil cooking spray to grease my muffin mould. But you can use any type of non-stick cooking spray, oil or even butter. 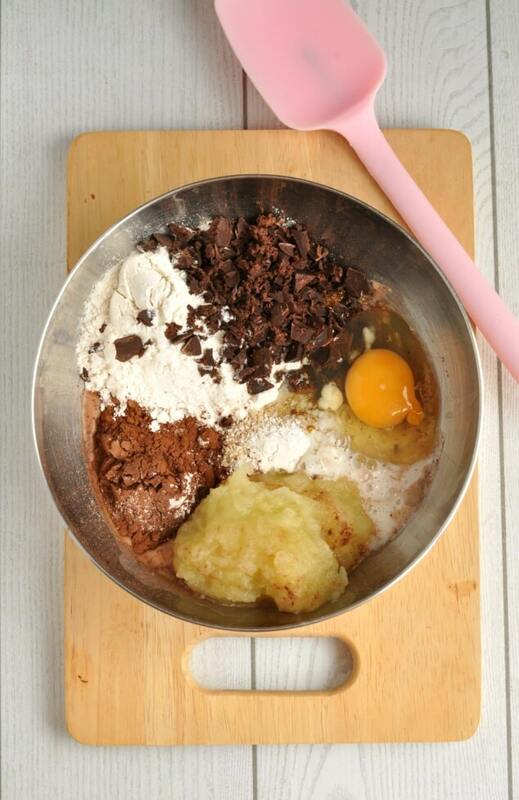 Anything edible and slippery that will help your muffins pop right out of the pan. The other thing I need to tell you about these muffins is that they’re not very sweet. My boyfriend loves them (he’s pretty much the benchmark for me to decide whether my healthy recipes are safe enough to share in the world where not everyone loves chia seed bars and acai bowls) but he does douse them in a decent dose of Golden Syrup. 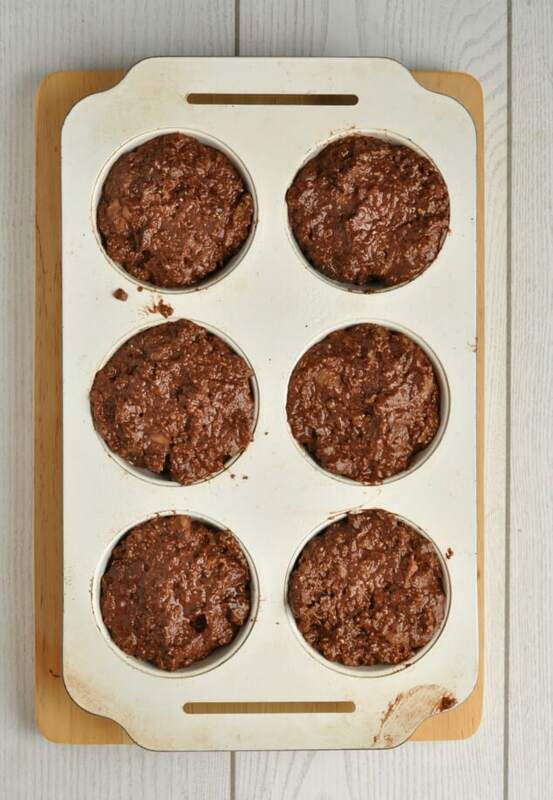 I, on the other hand, love these healthy double chocolate bran muffins just as they are. Insanely light for a healthy bran muffin, yet definitely filling enough to call breakfast and with just the right amount of melty dark chocolate chips to satisfy my sweet tooth. Yum! These muffins look delicious! I love any kind of chocolate muffin, especially if it’s healthier! Wow, these look yummy! Who doesn’t like chocolate for breakfast? I can’t wait to try these – maybe tomorrow so I can take them at the end of the week when I meet my friend for knitting at Starbucks. I loved your other recipe and have made it several times and took her one of those and she loved it too. I also shared your blog and link to the recipe with her. these look so good. Thanks for the recipe. Thanks for linking up at Tell Me About It Tuesday. We hope you hop over and share with us again next week. Those look delicious! I love the chips sticking out of the top, I could eat one right now. Thanks for linking up to Sweet and Savoury Sunday, stop by and link up again. Have a great day!! My muffins fell in the center and over ran the cup, also it made 17 small muffins. What did I do wrong? “1/4 tablespoon plus 2 cup brown sugar”??? This is definitely a typo of some kind (considering there’s not even one whole cup of flour in the recipe…) just can’t figure out what the intended quantity should be. Hey Robbyn! The correct amount is 1/4 cup + 2 tablespoons of brown sugar. The recipe card plugin has mixed the numbers up. I can’t fix it right now because I’m travelling and I don’t have access to a computer, but now you know. Enjoy the muffins! ???? I just read the comment about the brown sugar. I should have known better than to put that much in, but I did. I’ll have to make them again with the correct amount of brown sugar. So, I finally got the recipe right and I must say. These muffins are not only healthy, they are delicious. I’m adding them to my weekly baking. Thank You for such a wonderful recipe. Thanks so much for your sweet comment, Eldaka! It’s been quite a while since I made these muffins myself. You’ve inspired me to make a new batch this week! OMG I think these actually look BETTER THAN bakery – because I am pretty sure bakeries DO NOT normally use apple sauce in their recipes!! I am no chocolate girl, but these do look insanely delicious!